I whipped this baby up the other afternoon for Mom and had to contain myself from not eating it all before she even got a chance. Super easy, healthy, and delicious, this recipe is a nice savory incorporation into a dysphagia diet that can quickly be overcome with sweet drinks – from smoothies to milkshakes to Ensure and so on. Melt butter in a medium sized pan with your cream or milk. Cook down chopped white onion with garlic and your choice peppers in the butter-milk mixture. You want the onions to get soft and translucent, so 5 to 10 minutes over medium heat. Add thickening agent like 1 tbsp. flour to thicken mixture, stir vigorously. Add cream cheese, a pinch of nutmeg, and salt and pepper. Stir everything together and let it simmer for a couple minutes. Throw in heaps of fresh baby spinach and cook down stirring occasionally, add vegetable broth as needed to really get everything to mix up, it should sound creamy! This quick cream spinach is so savory, delicious, and nutritious! 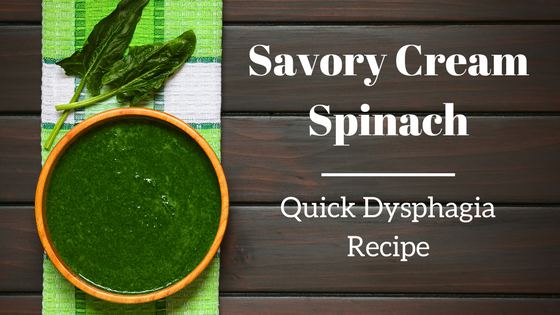 The half and half, butter, and cream cheese add calories, the spinach has iron, vitamin C, and loads of other nutrients, and like I said before, it’s such a yummy savory alternative to another sugary thickened dysphagia drink. Mom who has loads of trouble eating but scarfed down a whole cup of this stuff (via a bottle) for dinner, that’s saying a lot!